Citrix Receiver unattended installation with PowerShell is a must in automated environments. Also, Citrix Receiver requires some additional configuration to make it run smoothly in your environment. This article explains and automates the most important ones. Note: Citrix Receiver has been replaced by Citrix Workspace App. For detailed information how to install and configure Citrix Workspace App, see the article Citrix Workspace App unattended installation with PowerShell on this website. 24.09.2018: added Prevent an unexpected MSI repair from launching. The Citrix Receiver is a client component in a Citrix infrastructure that allows a user to launch Citrix XenApp and XenDesktop resources, such as published applications and desktops. This article is based on Citrix Receiver 4.12 released in June 2018. This is the last version of Receiver. Receiver has been replaced by Citrix Workspace App. Installing and configuring Citrix Receiver for Windows requires careful planning. 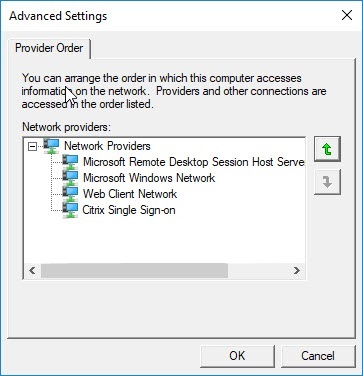 You need to decide which components to enable, how to configure the default device access behavior, how to configure the Citrix Receiver group policies, whether of not to allow single sign-on and more. For those of you who know my blog, Citrix Receiver is one of the components listed in my article Scripting the complete list of Citrix components with PowerShell, but I decided to create this stand-alone article to allow me to go into more detail. I strongly suggest you to read the article Receiver / Workspace app 1808 written by Citrix CTP Carl Stalhood. This is the most detailed article on Receiver available. Installing and configuring Citrix Receiver is not as straightforward as one might think. There are many details that can either make or break your deployment. Read and implement the sections below to ensure a smooth and successful deployment. Receiver can be installed both on your virtual servers and desktops (alongside the VDA) as well as on the local client device. This all depends on your Citrix infrastructure and your access scenarios. 4.12 (released in June 2018). This is the last version of Receiver. Receiver has been replaced by Citrix Workspace App. See the section Citrix Receiver command-line switches below. The following two command line switches are required to uninstall Citrix Receiver: /silent /uninstall. The /noreboot parameter is not needed during a silent installation according to the Citrix documentation. Make sure to create the destination directory beforehand. Reference: How to Manually Extract, Install, and Remove Individual .msi Files from Receiver.exe or ReceiverEnterprise.exe. The version is not displayed in the file name, so the file name is the same for each version of Receiver. To see the version of the executable, you have to take a look at the Details tab in the file properties. 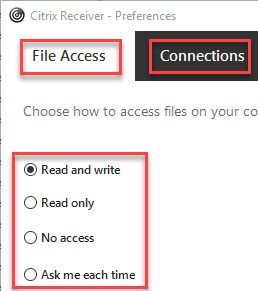 The version displayed in the details tab is always a little bit different than the commercial version displayed on the official Citrix download page. 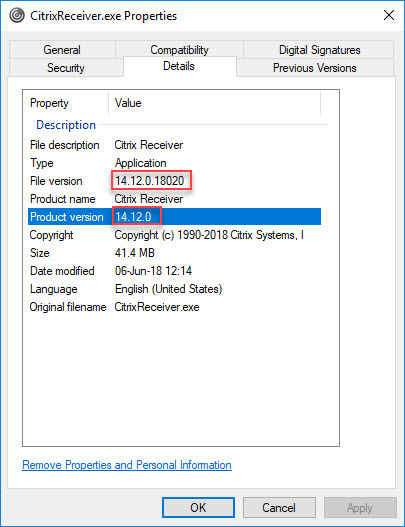 Version 4.12 of Citrix Receiver has the product version 14.12.0 and file version 14.12.0.17061. You basically should ignore the first "1" in the product version to get to the commercial version. So why are different numbers used for the same version you may wonder? The exact reason is not known to me, but it most likely has something to with re-branding. You see, the first 4.x version of Receiver (which was not called Receiver at that time) was released in 1998. In June of 2013, version 4.x resurfaced. Don't believe me? Check out the official Citrix Receiver for Windows Quick Reference Version List listing all Receiver versions since September 1998. The list seems to miss some newer versions that came after version 4.9 though. Another thing you should know about the installation file is that renaming it from CitrixReceiver.exe to CitrixReceiverWeb.exe changes the installation behavior. See the section Prevent the Add Account Window for more details. There are various parameters you can parse. For a detailed overview of all parameters please refer to the article Configure and install Citrix Receiver for Windows using Command Line parameters. I strongly suggest to read the entire article before deploying Citrix Receiver. 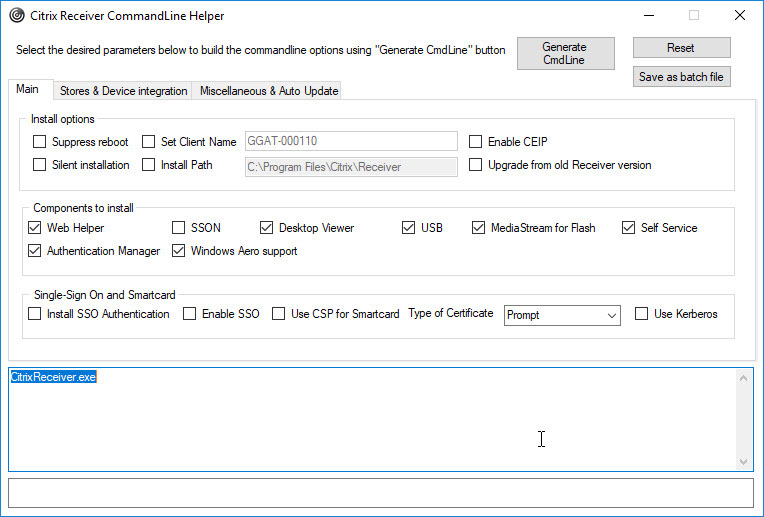 You can also use the Citrix Receiver Commandline Helper Tool to help you to build the exact command line syntax. Some parameters are required to work together with server-side components, such as enabling bidirectional content redirection. Some parameters require local administrator rights, such as /includeSSON to enable single sign-on authentication. In some cases a reboot may be required. For example, USB devices that are in suspended state when Citrix Receiver for Windows installs is not recognized by Citrix Receiver for Windows until after the user device is restarted (reference). All of my deployments are automated, including Citrix Receiver. I therefore need to use the /silent parameter. This enables single sign-on (pass-through authentication) so a user does not need to enter authentication information for a second time after logging on to Windows. This enables Local App Access. Do not enable participation in the Citrix Customer Experience Improvement Program (CEIP). CEIP collects anonymous statistics and usage information and sends them to Citrix. I personally prefer to test new versions of Citrix Receiver before implementing them in production (so no automatic updates are allowed). You can also omit this parameter entirely and manage the auto-update behavior using Group Policy. See also the Auto-Update section in Carl Stalhood's article Receiver / Workspace app 1808. The /noreboot parameter is not required for silent installations according to the Citrix documentation. If possible, I recommend rebooting the machine before using Citrix Receiver. The total number of log files depends on the number of components you install. Each MSI log file represents one component; the more components you install, the more log files will be generated (up to a total of 10). This directory is for sure used in many environments. Each user has its own temporary directory. This is almost the same directory as the previous one. The difference is that each user has its own temporary directory per session. If allowed by the administrator, a user can have multiple sessions on one system. This is the TEMP of the local SYSTEM account. Software deployment tools such as Microsoft SCCM use the SYSTEM account for installations on the local machine. This directory may be used on a FAT client. On a multi-user system it is not typical to use one temp directory for multiple users. Of course the TEMP directory in your environment may be different than the ones listed above. The environment variable %TEMP% will always contain the correct location of the TEMP directory. Unfortunately, there is no installation (or uninstallation) parameter that allows the log files to be written to another directory besides TEMP. There is no command-line switch like /Logfile or /Log. The only way to capture the log files in a directory other then TEMP is to copy them from the TEMP folder after the installation has finished. In the complete installation script below, the script starts by deleting any existing Citrix Receiver log files from the TEMP directory (lines 692 to 701). By using the environment variable %TEMP% the script makes sure that the correct TEMP directory is used. After the installation (or uninstallation), the script copies the newly created log files to the log directory declared in the variable $LogDir. The log directory ($LogDir) is a combination of the variables $BaseLogDir and $PackageName. You can change these variables in lines 669 and 670. 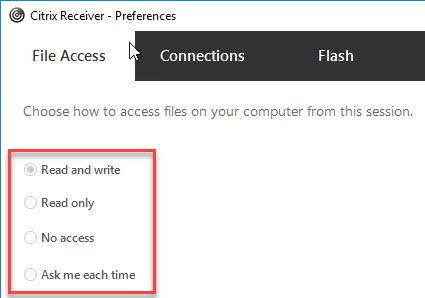 As per Citrix: "With the introduction of Receiver 3.x client, administrators can configure the default behavior for device access when connecting to a Citrix XenDesktop or XenApp environment. By default, the Desktop Viewer client device restrictions are based on the Internet region and this behavior can be changed by creating the Client Selective Trust feature registry keys under the HKEY_LOCAL_MACHINE hive in the registry and by modifying the required values." 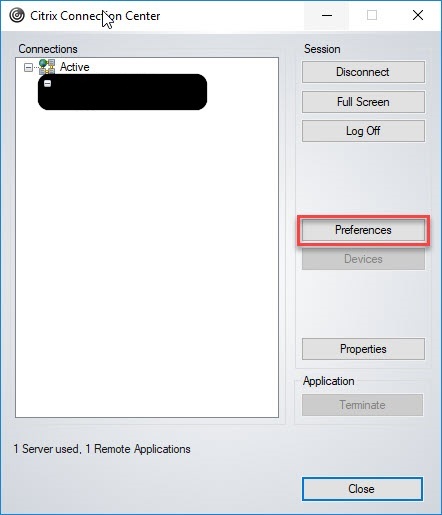 Please see the Citrix article How to Configure Default Device Access Behavior of Receiver, XenDesktop and XenApp for more information. I decided to modify the default behavior using the registry. I downloaded the ZIP file from the aforementioned article and modified the file ReceiverCSTRegUpx86.reg. I set all relevant registry entries to 2 (= Full Access) except for the Restricted Sites region/zone (these values remain on 0 = No Access). Note: yes, I used the file ReceiverCSTRegUpx86.reg even though I installed Receiver on a 64-bit operating system. On a 64-bit operating system, Receiver still installs itself in the folder C:\Program Files (x86) and all processes run in 32-bit. In the complete installation script below, the script imports the registry file in lines 752 to 756. Please make sure that you copy the actual file to the subdirectory Files. Also, in case you rename the registry file, please make sure to change the file name in the script as well (line 755). 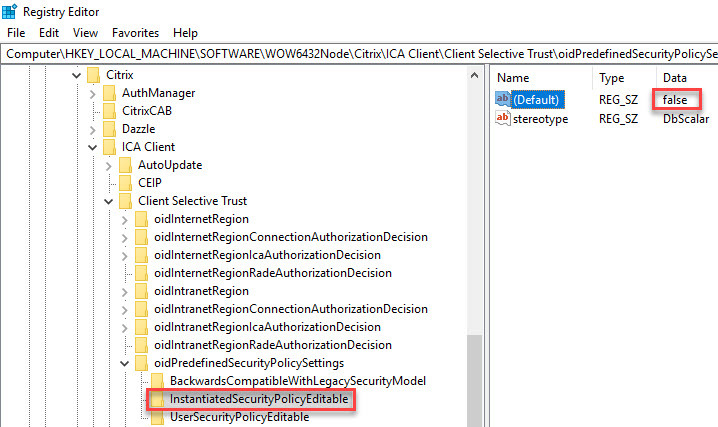 Please be aware that pre-configuring the Client Selective Trust settings does NOT prevent a user from changing these settings! A user can configure his or her connection preferences in the Connection Center under Preferences. As you can see in the screenshot below, after changing the (Default) value (REG_SZ) to false, the user is no longer able to change the preferences. You do not even need to close the active session for this setting to work. You only have to close the Preferences window and open it again after changing the registry value. The change is active instantly. DS_SetRegistryValue -RegKeyPath "hklm:\SOFTWARE\WOW6432Node\Citrix\ICA Client\Client Selective Trust\oidPredefinedSecurityPolicySettings\InstantiatedSecurityPolicyEditable" -RegValueName "(Default)" -RegValue "false" -Type "STRING"
Place it somewhere between lines 750 and 760. A big thanks to my colleague Wolfgang Thürr for bringing this to my attention. 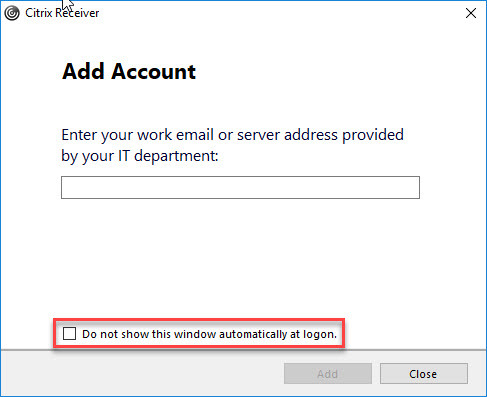 In the Add Account window, as per Citrix "users can [...] set up a Citrix Receiver account by entering email address or a server URL. Citrix Receiver determines the NetScaler Gateway, StoreFront server, or AppController virtual appliance associated with the email address and then prompts the user to log on for enumeration." By default, at the end of the installation, the Add Account button is shown. Rename the installation file CitrixReceiver.exe to CitrixReceiverWeb.exe (this name has to be exact including camel-case letters). Create the registry item EnableX1FTU in the registry key HKLM\SOFTWARE\Wow6432Node\Policies\Citrix with a DWORD value of 0 before running the installation. The result is that the Add Account button is not shown. In the complete installation script below, the registry item EnableX1FTU is created before installation, although strictly speaking it is not really necessary since the PowerShell script triggers a silent installation (so no GUI is shown anyway). By default, the Add Account window is also triggered at user logon. Add the registry item HideAddAccountOnRestart (DWORD) with a value of 1 to the registry key HKCU\Software\Citrix\Receiver. The tick box "Do not show this window automatically at logon" creates the same registry entry. Please be aware that this is a current user setting. I therefore recommend to use a Group Policy Preference (the article Configuring the time zone and code page with Group Policy demonstrates how to configure Group Policy Preferences). Set the value of the registry item AllowAddStore (REG_SZ) to N in the registry key HKLM\SOFTWARE\WOW6432Node\Citrix\Dazzle. You can also control this setting using a Group Policy. The complete installation script does not prevent the Add Account window from appearing at user logon. In case you want to prevent this from happening and you do not want to configure a Group Policy Preference, simply rename the CitrixReceiver.exe to CitrixReceiverWeb.exe as stated above. Note: renaming the CitrixReceiver.exe to CitrixReceiverWeb.exe means that e-mail based account discovery is no longer supported (reference: Deploy Citrix Receiver for Windows from Receiver for Web). 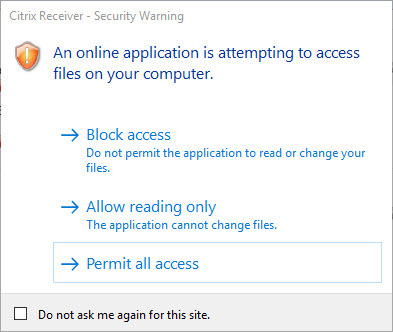 Also, see the official Citrix article How to Suppress the Add Account Window in Citrix Receiver for Windows for more information. It may happen that when you try to start a published application, an MSI installer repair of the component "Citrix Online Plug-in" is started. The exact cause for this behavior is unknown to me, but I can offer you a workaround. To solve this issue, you simply have to delete all data from the registry value WEB_CLIENT (part of the Citrix Online Plug-in MSI). Do not delete the registry value itself! Just remove the data from it ("empty" it) as shown in the screenshot below. In the complete installation script below, the data in the WEB_CLIENT registry value for Citrix Receiver 4.12 is removed (lines 760 to 768). In the complete installation script below, this shortcut is removed (lines 799 to 802). In the past, Receiver created a shortcut in the public (= All Users) Programs\Startup folder in the Start Menu. This is no longer the case, but the installation script does check for this value and removes it in case it exists. 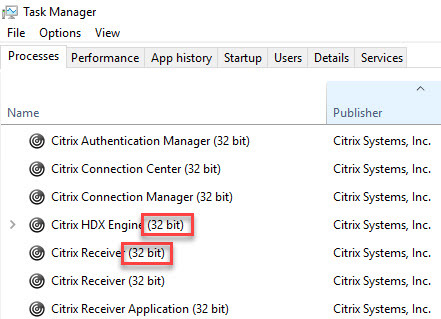 Citrix Receiver automatically starts at logon time by running the command "C:\Program Files (x86)\Citrix\ICA Client\concentr.exe" /startup (HKLM\SOFTWARE\WOW6432Node\Microsoft\Windows\CurrentVersion\Run -> ConnectionCenter). As per Citrix: "When launching published apps or desktops from a Windows 10 OS a [...] popup windows briefly appears prompting to press Win + G for the game bar or for the search bar." The complete installation script below sets this registry value (line 778). When you install the Receiver Single Sign-on feature (/includeSSON), an entry is created in the network provider order. What is the network provider order? In the registry, the list and order of the Microsoft and third-party network providers can be found here: HKLM\System\CurrentControlSet\Control\NetworkProvider. Citrix adds the entry PnSson (= Citrix Single Sign-on). Citrix recommends that this entry is listed as number four, after the three default Windows network providers (see the info box above). Let's start with the bug. As described by Citrix in the article Windows 10 Fall Creators Update (v1709) – Citrix Known Issues, the network provider has a bug (which should be fixed in Windows 10 version 1803). The bug is that no third-party network provider, including Citrix's PnSson value, is populated under the newly introduced registry key ProviderOrder under HKLM\System\CurrentControlSet\Control\NetworkProvider. 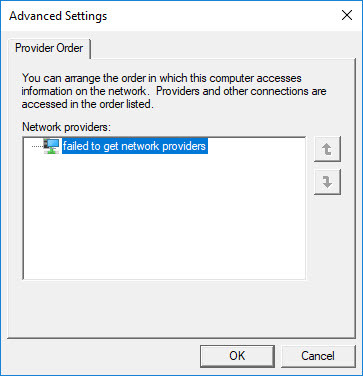 This bug causes the error "failed to get network providers" when you try to display the network provider order graphically. Please be aware that the actual functionality of the network provider still works. In the past, the order of the network provider was determined by the order of the entries in the registry item ProviderOrder under HKLM\System\CurrentControlSet\Control\NetworkProvider\Order. With Windows 10, this is no longer the case. The order is now determined by the decimal value of the network provider (HKLM\System\CurrentControlSet\Control\NetworkProvider\ProviderOrder). The item with the lowest number is executed first and the item with the highest number last. In the article Windows 10 Fall Creators Update (v1709) – Citrix Known Issues, Citrix recommends to create the missing item using the decimal DWORD value of 4000. I recommend to use a different number, for example 3001 or 3500. The reason for this is simple; you may have another third-party product that already occupies the number 4000. This is for example the case when you install a product such as Lotus Notes including the Notes Single logon service. The main goal is that the PnSson value is listed as the fourth item, after the three default Microsoft ones. The third Microsoft entry has the value of 3000, so the value PnSson needs to have a higher value (at least 3001 or higher). In the complete installation script below, the missing network provider registry item is created in lines 782 to 787. The PnSson item is either created or modified. See the example in the previous section how to add these vales to the complete installation script. Create an installation directory on the local computer or on a file share (UNC path). For example: C:\Temp\Citrix\Receiver. Create a subdirectory called Files. Download and copy the Receiver CitrixReceiver.exe to the folder Files in the installation directory. Download and copy the registry file (*.reg) containing the Client Selective Trust registry keys and values to the folder Files in the installation directory. Copy the complete PowerShell script below to a new PS1 file (e.g. Install_CitrixReceiver.ps1) and add this file to the root of the installation directory (not in the subdirectory Files). Optional: modify the location of the log directory in lines 669 and 670. This parameter contains the text (the line) you want to write to the log file. If text in the parameter is omitted, an empty line is written. DS_WriteLog -InformationType "I" -Text "Copy files to C:\Temp" -LogFile "C:\Logs\MylogFile.log"
DS_WriteLog -InformationType "E" -Text "An error occurred trying to copy files to C:\Temp (error: $($Error))" -LogFile "C:\Logs\MylogFile.log"
DS_WriteLog -InformationType "-" -Text "" -LogFile "C:\Logs\MylogFile.log"
This parameter contains the file name including the path and file extension, for example C:\Temp\MyApp\Files\MyApp.msi or C:\Temp\MyApp\Files\MyApp.exe. This parameter contains the installation type, which is either 'Install' or 'Uninstall'. This parameter contains the command line arguments. The arguments list can remain empty. to be specified in the 'Arguments' parameter: /i (or /x) /qn /norestart /l*v "c:\Logs\MyLogFile.log"
DS_InstallOrUninstallSoftware -File "C:\Temp\MyApp\Files\MyApp.msi" -InstallationType "Install" -Arguments ""
DS_InstallOrUninstallSoftware -File "C:\Temp\MyApp\Files\MyApp.msi" -InstallationType "Uninstall" -Arguments ""
DS_InstallOrUninstallSoftware -File "C:\Temp\MyApp\Files\MyApp.exe" -InstallationType "Install" -Arguments "/silent /logfile:C:\Logs\MyApp\log.log"
$FixedArguments = "/x ""$File"" /qn /norestart /l*v ""$LogFileAPP"""
$FixedArguments = "/i ""$File"" /qn /norestart /l*v ""$LogFileAPP"""
This parameter can contain multiple file and folder combinations including wildcards. UNC paths can be used as well. Please see the examples for more information. This parameter contains the destination path (for example 'C:\Temp2' or 'C:\MyPath\MyApp'). This path may also include a file name. This situation occurs when a single file is copied to another directory and renamed in the process (for example '$Destination = C:\Temp2\MyNewFile.txt'). UNC paths can be used as well. The destination directory is automatically created if it does not exist (in this case the function 'DS_CreateDirectory' is called). automatically extracted, checked and created if needed. DS_CopyFile -SourceFiles "C:\Temp\MyFile.txt" -Destination "C:\Temp2"
DS_CopyFile -SourceFiles "C:\Temp\MyFile.txt" -Destination "C:\Temp2\MyNewFileName.txt"
DS_CopyFile -SourceFiles "C:\Temp\*.txt" -Destination "C:\Temp2"
DS_CopyFile -SourceFiles "C:\Temp\*. *" -Destination "C:\Temp2"
Copies all files within the root directory 'C:\Temp' to the destination directory 'C:\Temp2'. Subfolders (including files within these subfolders) are NOT copied. DS_CopyFile -SourceFiles "C:\Temp\*" -Destination "C:\Temp2"
Copies all files in the directory 'C:\Temp' to the destination directory 'C:\Temp2'. Subfolders as well as files within these subfolders are also copied. DS_CopyFile -SourceFiles "C:\Temp\*.txt" -Destination "\\localhost\Temp2"
Copies all files with the file extension '*.txt' in the directory 'C:\Temp' to the destination directory '\\localhost\Temp2'. The directory in this example is a network directory (UNC path). # Check if the destination path exists. If not, create it. This parameter contains the full path to the directory which needs to be deleted (for example C:\Temp\MyOldFolder). This parameter contains the full path to the file (including the file name and file extension) that needs to be deleted (for example C:\Temp\MyOldFile.txt). DS_DeleteRegistryValue -RegKeyPath "hklm:\SOFTWARE\MyApp" -RegValueName "MyValue"
This parameter contains the full path, file name and file extension of the registry file, for example "C:\Temp\MyRegFile.reg"
Imports registry settings from the file "C:\Temp\MyRegFile.reg"
DS_SetRegistryValue -RegKeyPath "hklm:\SOFTWARE\MyApp" -RegValueName "MyStringValue" -RegValue "Enabled" -Type "String"
DS_SetRegistryValue -RegKeyPath "hklm:\SOFTWARE\MyApp" -RegValueName "MyBinaryValue" -RegValue "01" -Type "Binary"
DS_SetRegistryValue -RegKeyPath "hklm:\SOFTWARE\MyApp" -RegValueName "MyDWORDValue" -RegValue "1" -Type "DWORD"
DS_SetRegistryValue -RegKeyPath "hklm:\SOFTWARE\MyApp" -RegValueName "MyQWORDValue" -RegValue "1" -Type "QWORD"
DS_SetRegistryValue -RegKeyPath "hklm:\SOFTWARE\MyApp" -RegValueName "MyMultiStringValue" -RegValue "Value1,Value2,Value3" -Type "MultiString"
DS_SetRegistryValue -RegKeyPath "hklm:\SOFTWARE\MyApp" -RegValueName "MyExpandStringValue" -RegValue "MyValue" -Type "ExpandString"
$Folders = Get-ChildItem $env:Temp -filter "CTXReceiverInstallLogs*"
DS_SetRegistryValue -RegKeyPath "hklm:\SOFTWARE\Wow6432Node\Policies\Citrix" -RegValueName "EnableX1FTU" -RegValue "00000000" -Type "DWORD"
DS_DeleteRegistryValue -RegKeyPath "hklm:\SOFTWARE\Wow6432Node\Policies\Citrix" -RegValueName "EnableX1FTU"
DS_DeleteRegistryValue -RegKeyPath "hklm:\SYSTEM\CurrentControlSet\Control\NetworkProvider\ProviderOrder" -RegValueName "PnSson"
# Import the Client Selective Trust registry keys and values. This prevents annoying security popup message regarding permissions for access to files, microphones, cameras, scanners, etc. in the local intranet and trusted sites. $RegFile = Join-Path $StartDir "Files\CitrixReceiver_Client_Selective_Trust_x86_Dennisspan.com.reg"
DS_SetRegistryValue -RegKeyPath "hklm:\SOFTWARE\Microsoft\Windows\CurrentVersion\Installer\UserData\S-1-5-18\Products\$($ProductID)\Features" -RegValueName "WEB_CLIENT" -RegValue "" -Type "String"
DS_SetRegistryValue -RegKeyPath "hklm:\SOFTWARE\Policies\Microsoft\Windows\GameDVR" -RegValueName "AllowGameDVR" -RegValue "00000000" -Type "DWORD"
# By default, each network provider item gets a value of one thousands or higher, always an even 1000 value. For example: 1000, 2000, 3000, etc. DS_SetRegistryValue -RegKeyPath "hklm:\SYSTEM\CurrentControlSet\Control\NetworkProvider\ProviderOrder" -RegValueName "PnSson" -RegValue "3001" -Type "DWORD"
$File = Join-Path $env:AllUsersProfile "Start Menu\Programs\Startup\Receiver.lnk"
$File = Join-Path $env:AllUsersProfile "Start Menu\Programs\Citrix Receiver.lnk"
$Source = Join-Path $CitrixLogPath "*.log"
Removing these two registry keys is recommended by Citrix (see the section Uninstalling Citrix Receiver for Windows in the article Install and Uninstall Citrix Receiver for Windows manually). There are more settings that can be directly configured during the installation of Citrix Receiver. Most of these configurations concern the Windows registry. Please see the section Registry Values in Carl Stalhood's article Receiver / Workspace app 1808 for more information. In case you want to add additional configurations to the complete installation script, I recommend copying and reusing existing lines of code. Please be aware that many settings can nowadays be managed using Group Policy. Citrix Receiver comes with a large collection of Group Policies settings. Please see the section Receiver Group Policy ADMX Template in Carl Stalhood's article Receiver / Workspace app 1808 for more information. The actual ADMX files can be downloaded on the Citrix website (in the section Downloads for admins), but they are also included in the installation directory of Receiver (C:\Program Files (x86)\Citrix\ICA Client\Configuration). Pass-through authentication (or single sign-on) requires many different settings to be correctly configured, such as Trusted Sites, Trust XML Requests on the Delivery Controller, installing the Single Sign-On component in Receiver and more. Please see the section Pass-through Authentication in Carl Stalhood's article Receiver / Workspace app 1808 for a complete overview of what needs to be configured. Citrix Receiver version 4.5 and higher comes with a build-in tool for checking the SSON configuration (see the Citrix article SSON Configuration Checker for Citrix Receiver for Windows). You install Receiver as a stand-alone installation (as described in this article) and you install the Virtual Delivery Agent excluding Receiver. This is accomplished by using the command line /components VDA as described in the section Citrix Virtual Delivery Agent in my article Scripting the complete list of Citrix components with PowerShell. You install the version of Receiver included in the Virtual Delivery Agent installation sources (in this case you do not use the /components parameter). When using Skype for Business in your environment, you may want to install the HDX RealTime Media Engine on your client device together with Citrix Receiver. Citrix Receiver is a prerequisite for the Media Engine; without Receiver, Media Engine cannot be installed. To automate the installation of the HDX RealTime Media Engine, please see the section HDX RealTime Media Engine for Windows in my article Scripting the complete list of Citrix components with PowerShell. Also, for extensive information on Skype for Business, Citrix and the HDX RealTime Optimization Pack, please see the section Skype for Business in Carl Stalhood's article Receiver / Workspace app 1808. I also highly recommend you to read the article Skype for Business with XenApp & XenDesktop written by Citrix CTP George Spiers. If you want to go one step further and create an SCCM package as well, please follow the step-by-step explanation in the article Deep dive creating SCCM packages for Citrix. I hope the information in this article was of some help to you. Happy scripting! Dennis Span works as a Senior Citrix Architect for a large insurance company in Vienna, Austria. He holds multiple certifications such as CCE-V, CCIA and CCEA. In 2017, Dennis became a Citrix Technology Advocate (CTA). Besides his interest in virtualization technologies and blogging, he loves spending time with his family as well as snowboarding, playing basketball and rowing. He is fluent in Dutch, English, German and Slovak and speaks some Spanish. This entry was posted in CVAD (XenDesktop) and tagged PowerShell, Receiver, Scripting by Dennis Span. Bookmark the permalink. What a master piece Dennis ! I’ve rarely seen a such comprehensive article on the subject, you rock ! Thanks a lot Yvan! I am happy you like it!